IMPROGUISE 7th ANNUAL IMPROV FEST. Alexander Bar. From the brilliant minds of ImproGuise comes a wonderful week of theatre sports with the 7th Annual Improv Fest at the charming Alexander Bar on Strand. The fest began on Tuesday, 9 April with a cast improvising in a fictional setting deemed the Fake Place, followed by Stuck in the Middle in which one improviser was selected to adjust to the scenes presented by the other performers. Thursday saw a “made-up” band take to the stage and perform “made-up” songs for a “rockumentary” tribute show, and Friday welcomes a classic, competitive night of theatre sports where two teams will be scored on their improv abilities by the audience. Saturday brings the festival to a close with a challenge involving five actors taking turns to direct a scene and voted off by an audience clap-o-meter in SuperScene. Wednesday’s show began with James Harvey playing a keyboard quite passively in the corner of the stage; his delicate dealings with the instrument carried us through the craziness that ensued. 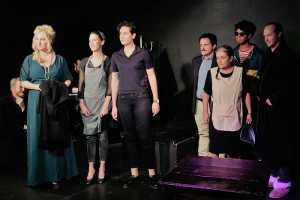 A motley group of highly talented actors: Megan Furniss, Tandi Buchan, Brett Anderson, Troydan Berg, Ryan Jales, Keren Lindley, Leon Clingman, Dave Campbell-Watts and Pete Faure appeared on stage dressed head-to-toe in black and one unfortunate actor was chosen by the lot of an audience member to become the improvisor stuck in the middle. The chosen performer was Brett, a great selection as he has been performing in theatre sports for 20 years. Brett navigated the ridiculous cues from his peers with ease, acumen and wit, even in their attempts to make it particularly hard for him, such as the moment Megan asked him to sing a fake song in its entirety and when Tandi was watching the dramatic opening scene of a fake movie in which he, the main character gets shot within the first few seconds after which the reminiscent actor assures her that he starred in the rest of it as the film was just a long flashback. Besides the intimate setting of the Alexander Bar’s upstairs theatre and the fact that drinks are allowed inside, the atmosphere inspired by the improvisors further relaxes the audience with a sense of gaiety and friendship that emerges in reoccurring gags between performers. A fun example was the initial referral to Megan’s flowing arms as a sudden fire which the others latched onto and mentioned every time Megan did something mildly flowy on stage. Another instance of this improv camaraderie was the constant casting of Brett as a fish. At first, I didn’t quite understand his humorous look of disdain as he slowly flapped his hands beside his face, imitating gills with odd familiarity, or the subsequent sea-themed musical that concluded the show, but it seems that this is a not-so-subtle reference to his nickname “Fish”. ImproGuise is certainly worth a watch and makes for a delightful evening out of high energy, music and belly-aching laughter.